On Friday, May 30th we will launch a new workshop series called DJ Tech Talks, featuring discussions on the latest DJ technology and how to use these new tools. Join Nick De Friez & Matt Perry (Serato) at our NYC location from 3:30pm to 5:30pm EST. DJ Tech Talks is a new Dubspot workshop series that features the latest in DJ technology with discussions on how to use these tools. This month features an in-depth look at the new features of Serato DJ and Serato Video. Topics include: beat grids, sync, upgrades, licensing, the Serato iOS remote, the remote mini app, and Serato Video recording. 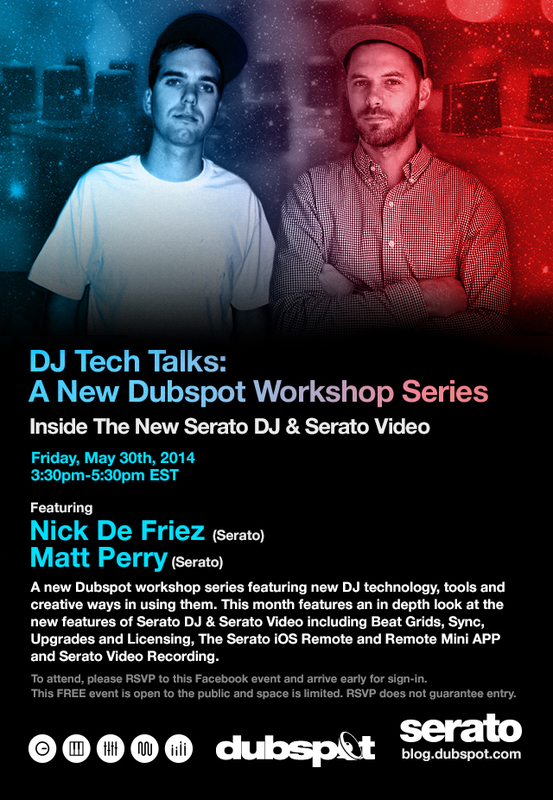 This workshop takes place at Dubspot NYC on Friday, May 30th from 3:30pm to 5:30pm with hosts Nick De Friez & Matt Perry (Serato). To attend, please RSVP to this Facebook event and arrive early for sign-in. This FREE event is open to the public and space is limited. RSVP does not guarantee entry. Our DJ / Producer Master Program is the most comprehensive collection of courses that we offer. Courses included in this program: DJ Extensive, Music Foundations, Ableton Live Producer Certificate Program, Sound Design, and Mixing and Mastering. If you have been thinking about learning the fundamentals of music production, DJing, sound design, mixing and mastering, this complete and extensive program is designed to get your started on your journey of musical discovery. We are currently in the middle of a Sale. Enroll now, save 15% and get free Ableton Live Suite while seats are still available!